Experience Paris by night and see Paris in a whole new light. 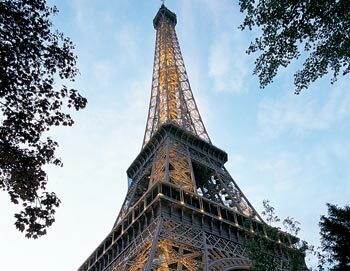 The tour includes a visit to the Eiffel Tower, where you get to skip the long lines and take the elevator straight up and a scenic cruise on the Seine, where you can spot all of the major sights. The first part of this sightseeing tour starts by visiting the 2nd floor of the Eiffel Tower, probably the most famous building in Paris, and from here you have a stunning view over Paris. Next your guide will take you to the second part of this tour - A beautiful boat cruise down the Seine, where you will see many of Paris' monuments illuminated from the river side. The tour ends with a bus tour through Paris, which gives you the opportunity to discover Paris, its history, its tree-lined boulevards with their bustling cafes, and all the brilliantly illuminated monuments and squares, such as Concorde and Vendome Squares, Opera, Madeleine Church, rue Royale, Champs-Elysees, Arch of Triumph, Trocadero, Invalides, Notre-Dame and Chatelet Square to name some of the attractions you will see. During the tour you'll learn about of this beautiful city with your free audio guide (available in French, English, Spanish, German, Italian, Portuguese, Dutch, Korean, Russian, Greek, Japanese or Chinese-Mandarin).If you like the sound of this tour you might also like our Evening Tour & Cruise combination. The tour starts at our agent PARISCityVISION's office. Please be there at least 30 minutes before the tour starts. The tour ends at the back at the PARISCityVISION office.